The Revival Mission is on the cutting edge of what God is doing in Africa and more specifically in the nation of Nigeria at this time where we are having our missionary base. 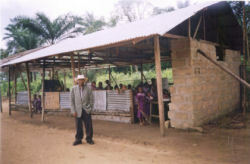 We believe that as a Church and Ministry, we are strategically located in the continent to reach out in ministry to the hurting, suffering, and economically deprived people who have suffered from years of civil and tribal wars due to bitterness and the clamor for power and control of lean natural resources of corrupt leaders. We aim at completing the task of the Great Commission with other similar minded organizations and bodies within and outside our borders in partnership and affiliation in our collective bid for missions and the expansion of God’s Kingdom in our world. © Copyright 2005 - 2019, The Revival Mission. All Rights Reserved.